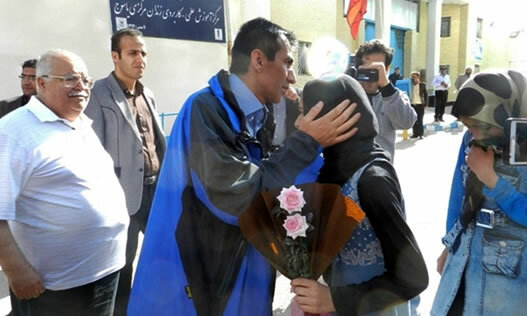 Asadollah Taghizadeh, a forest ranger who was arrested and sentenced to Qesas seven years ago for killing an illegal hunter in the Dena forest region, was released on Monday March 7 after the family of the deceased gave their consent. Taghizadeh and two other rangers were confronted by a group of five illegal hunters in Kogilouyeh and Boyerahmad Province in 2008. After the hunters opened fire on the ranger, Taghizadeh reportedly fired back and hit one of the hunters, who later succumbed to his injury in hospital. Taghizadeh was sentenced to death in 2011, and the sentence was later upheld by the appellate court. On Sunday March 6, the family of Mojtaba Rezai agreed to forego their right to Qesas, and Taghizadeh was consequently released today. Upon his release, Taghizadeh expressed his thanks to the family of the deceased and his many advocates.